It’s one of my favourite weekends on the river this Saturday and Sunday when Sunbury stages its annual regatta – always guaranteed to be a great fun day almost regardless of what the weather throws up. It’s the 133rd year that the event has been staged and it never fails to draw the crowds who will enjoy some very competitive skiff racing, traditional punt racing and then, the real fun stuff of dongola racing. The skiff and punt competitions are taken very seriously with crews coming from far and wide. The dongola racing – crews of four or six people kneeling in a punt and using short paddles to get through the water – is much more light-hearted and tends to feature a number of local crews representing various organisations and pubs. I almost guarantee a lot of folk will end up soaked! On the Sunday, the Edith Topsfield Regatta gives youngsters a chance to get out on the river and compete. The Saturday proceedings start at 9am on Rivermead Island in Lower Sunbury and in addition to the water-borne activities there is always loads for the family to enjoy including a funfair, side shows, stalls and food of all different kinds. Once the racing and prize-giving is over in the late afternoon, live bands will be performing in the main marquee and the day is capped off by an illuminated sail past organised by the members of the Middle Thames Yacht Club and a fabulous firework display. Admission to the island costs £3.50 but children under 13 go free. Get down there and support a great local event. TIMED to coincide with the regatta, Saturday also sees the Spelthorne Mayor’s River Day. 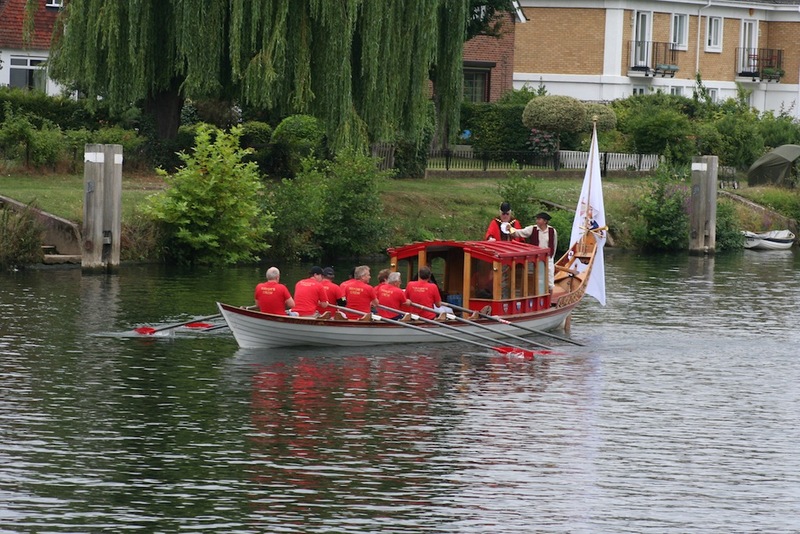 Dreamed up by Judith Wood-Dow when she was major, the event sees the current mayor rowed down the river in a traditional shallop, a sort of royal barge, by a crew consisting mainly of former mayors or their partners (including Nick Wood-Dow). The crew will also boast among its number local MP Kwasi Kwarteng and the man who built the shallop, Mark Edwards. The party will be leaving the Thames Lodge Hotel in Staines at 9.30am and will travel down through four locks – Penton Hook, Chertsey, Shepperton and Sunbury – to arrive at the Sunbury regatta site at about 1.30pm. As always, the Mayor is keen for as many boats as possible to join with his flotilla and it would be great if they got a good turnout at the locks and on the riverbank to wave them on. At the regatta, the Mayor’s crew and the other boats in the flotilla will join in a special pre-Olympic event from 1.30 until 3pm, which is an Edwardian re-enactment of a regatta held in 1901. The participants will be dressed in Edwardian costume, and will recreate a typical event of some 110 years ago. This re-enactment is part of the Surrey Heritage Sporting Life programme, and the Cultural Olympiad events in the run-up to the London Olympics 2012. Go and give them a cheer – it’s hard work rowing that shallop!